I turned 30 recently. I had a party, but I pretended that I was three years old. Naturally, there had to be a jumping castle. 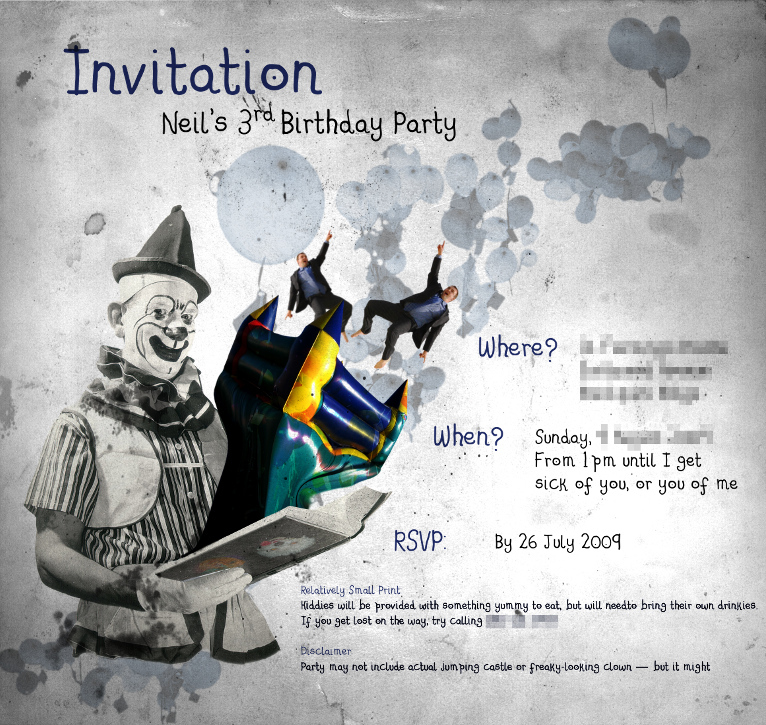 There was going to be a jumping castle and a clown, but in the end I decided to combine the two by hiring a clown who was willing to be jumped on by fully-grown adults. Check out the gallery on my Flickr account. There is a lengthy story to go with this too, but lengthy stories take time to write (hell, uploading and titling the photographs took long enough). Plus, I received many gifts and need to thank all the nice people who gave them to me. Hopefully, a longer story will be forth-coming. But if not, the photos tell the story well enough, I think. A party is happening at No. 14 on Sunday, 9 August, starting at 1pm. We are celebrating Women’s Day! Not really. It’s a birthday party. But we may also celebrate women although that wasn’t the original intent of organising the party. I don’t expect it to be too disruptive, but there will be music and a jumping castle. Noise from my home is likely to be elevated above normal Sunday afternoon dog-barking levels. Roughly 35 guests are expected, so you may find the road inside the complex becoming a little congested. I hope this will be bearable for one afternoon. If you find yourself becoming incensed by any aspect of the activities taking place at No.14 on Sunday, please let me know. I’m a reasonable man. I’ll make you an offer you can’t refuse.